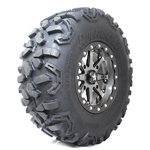 This new extreme duty STI radial tire is built to confidently handle the ever larger, faster and heavier UTVs as well as many ATV applications. Roctane tires feature a heavy nylon cord that maximizes tire toughness while retaining tire flexibility for a smooth, yet comfortable ride. It features a non-directional tread and wide profile footprint. Reinforced lower sidewalls and extra-wide tread belts help for added shoulder protection and stability. The super-deep rim guard protects even the thickest wheel lips from trail damage. The Roctane XD's specially formulated tread compound extends its life even further, yet it still grips the slickest rocks like a dedicated wall-crawler. Stiff tire casing. 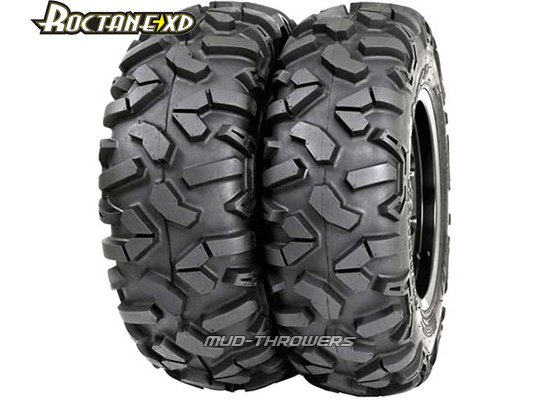 I've had a lot of different kinds of atv tires in the past and the Roctanes are hands down the very best, longest lasting trail tire that I have tested yet! I have 26" Roctanes on my tuned Sportsman 1000 and they handle the power and abuse really well. 1,500 miles and the rear tires are only 50% worn and that's with constantly spinning the rear tires on gravel and pavement . The front tires are still like brand new. Very impressed with the traction, especially in the mud. Very surprised actually how well they do in the mud. The casing is tough as nails and the rubber is a super hard, long lasting compound that ride really smooth. No shimmy or vibrations on pavement. What an awesome all around, super long lasting tire! Just hit 2,000 mile mark on my 26" Roctanes on my tuned and clutched Sportsman 1000. The front tires still look new with 95% tread left. The rear tires still look decent with about 50% tread left. I've looked hard at replacing them with another kind tire, but it's really hard to beat the performance and longevity of the Roctanes. I could easily see 5,000 miles out of the front tires. Too bad I abused the rear tires so badly by constantly spinning them over sharp rocks and gravel roads and miles and miles of pavement pounding. I'll be upgrading to another set of larger 27" or 28" Roctanes here for the next riding season. I can't see any other kind of tire lasting longer than these! Also, not a single flat tire or puncture either!